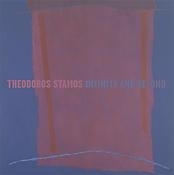 Hollis Taggart Galleries is pleased to announce Theodoros Stamos: Infinity and Beyond. The youngest member of the “Irascibles,” the vanguard group of American artists memorialized in Nina Leen’s 1950 photograph, Theodoros Stamos was only twenty years old when he received his first one-man show at the Betty Parsons Gallery. He drew early acclaim for his abstracted biomorphic imagery in the 1940s and early 1950s, revealing what his friend and fellow artist Barnett Newman described as a “true communion” with nature. In the late 1950s he began to concentrate on fully abstract painting, first in a set of paintings simply entitled “Fields” in the 1950s, and later in his celebrated Infinity Field series, which is the focus of the present exhibition. The first paintings Stamos undertook in Lefkada, such as the rare Infinity Field and Infinity Field, Lefkada, serve as nexus points indicating the directions the artist’s work would take in the three decades that followed. The insistent horizontality of the former mimics the format of landscape paintings, and the subtle line traversing the canvas implies a horizon, a notion to which the painting and series title—Infinity Field—nods. Through the understated modulation of color in the latter work—vibrant persimmon hues—and the suggestion of fields contained within fields through the use of faint “linear couples,” Stamos creates a masterful painting that seems to glow from within, emitting a warm light through its mottled paper surface. The sensitivity to light, meditative atmosphere, and complex treatment of space displayed in these two paintings are hallmarks of the artist’s Infinity Field series. An early work, Above-Below, from 1961, signals the artist’s preoccupation with rendering space beyond the confines of the two-dimensional pictorial surface. Through the use of color and composition, Stamos creates a sense of the expansiveness of pictorial space; he explained, “my feeling was to create more infinity with color….” He also explored various compositional techniques to suggest layered space, as a rare untitled collage attests. In establishing a tension between the flatness of the two-dimensional painting and the intimation of unbounded space created by his delicate washes and rectangular color blocks, Stamos’ art represents a major contribution to color field painting. In their often large-scale paintings, color-field painters sought lyrical or atmospheric effects, immersing their viewers in a color environment. In his insistence on maintaining a human scale for his work Stamos’ approach differed from his colleagues, in that his paintings continuously reference the human element even as they reach for the infinite. Underpinning the lyricism of Stamos’ paintings are his interests in mythology, botany, and Eastern philosophy. 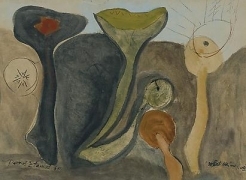 Like many of his colleagues, in the years during and following World War II, Stamos began to express a concern with creating universal themes and imagery. He viewed his surroundings as touchstones of the ancestral past, where the rocky shores, white cliffs, and ocean waves were evidence of civilizations of centuries past and stories generations old. His Spartan mother, in particular, had regaled him with Greek lore, which no doubt had sparked his interest in mythological and historic sites. Infinity Field, Nemea #3 (1973), for example, references in its title the home of the Nemean Lion, a great monster which Heracles killed as the first of his twelve labors. Stamos, who had suffered his own public battles, likely took this story of Greek heroism to heart. The later Infinity Field, Lefkada Series (For Niko Xylouris) evokes more recent history in its homage to the great Cretan musician Niko Xylouris. A painting such as Infinity Field, Lefkada Series from 1981 approximates a landscape seen from above, a topographical map of sorts. The sensuous textures of the central rectangular fields, as in the variegated lavender surface that resembles milky quartz or gemstone, seem themselves to be derived from the earth. Although devoid of specific references, the suggestions of landscape in Stamos’ Infinity Field series should come as no surprise. For Stamos landscape as a genre, as a way of seeing, served as a branching off point for his paintings. He named as influences the “organic aesthetics” of the Hudson River School, the romantic and visionary aspects of Albert Pinkham Ryder, and the landscapes of Winslow Homer, and George Inness.